Property taxes remain the primary source of tax collections at the local level, responsible for 72.5 percent of local tax revenue in fiscal year 2014. Once a significant driver of state budgets as well, their share of state collections has dropped to a mere 1.6 percent. While they feature prominently in public debate, corporate income taxes only generated 3.7 percent of state and local tax revenue in fiscal year 2014. They are also among the more volatile sources of revenue for states. Individual income taxes are the second largest source of state tax revenue, though nine states forego the taxation of wage income (of these, two tax interest and dividend income). Income taxes are less pro-growth than consumption taxes because they discourage savings and labor force participation. Sales taxes generated 31.4 percent of state tax revenue in fiscal year 2014, and are a significant source of revenue for all 45 states which impose them. They also constitute a major local government revenue stream in some states, with local governments in three states deriving more than 40 percent of their tax revenue from sales taxes. Significant regional variations exist in tax reliance, with New England states relying the most heavily on property taxes, while Southeastern and Southwestern states lean on sales taxes for a large share of their state and local tax revenue. Severance taxes have an outsized influence in the more resource-rich Far West. The mix of tax sources states choose can have important implications for both revenue stability and economic growth, and the many variations across states are indicative of the different ways that states weigh competing policy goals. Maine has its blueberry tax and the voluminous Alabama constitution specifically provides for mosquito taxes in Mobile County—alas, the tax is levied on property, not mosquitoes—but when state and local governments wish to raise revenue, they generally turn to a traditional canon of tax options, like property taxes, sales taxes, and individual and corporate income taxes. The degree to which states lean on these options, however, and the extent to which they turn to alternatives, varies based on demography, geography, and even ideology. Oregon derives over two-thirds of state tax revenue from income taxes, while North Dakota raises less than a tenth of its revenue that way. In New England, only 1.4 percent of local government tax revenue comes from sales and gross receipts taxes, compared to 34.0 percent in the Southwest. In “live free or die” New Hampshire, 23.7 percent of state tax revenue is generated by corporate taxes, whereas such taxes are responsible for a mere 2.1 percent of state revenue in Hawaii. A state with an abundance of natural resources, like North Dakota, might turn predominantly to severance taxes, while one with a high volume of tourists, like Florida, can see value in relying heavily on sales taxes. Some states, particularly in New England, have longstanding traditions of both state and local property taxes, while others, especially in the Southeast, make extensive use of general sales taxes at both levels of government. Source: Census Bureau; Tax Foundation calculations. Property taxes are a major source of state and local tax revenue, responsible for 31.3 percent of collections across all state and local tax jurisdictions in fiscal year 2014 (the most recent year for which data are available). This is driven almost entirely by the predominance of property taxes in the local revenue toolkit, where they are responsible for 72.5 percent of all tax revenues. Most states have abandoned, or nearly so, any reliance on statewide property taxes, which now account for a mere 1.6 percent of state tax revenue nationwide, down from 52.6 percent in 1902. This category includes both commercial and residential real estate in addition to tangible personal property taxes levied on business equipment as well as select personal property like cars and boats. Real estate taxes are typically a source of local tax revenue, while personal property taxes may fund state or local governments, or both. States have been moving away from the taxation of personal property, but for now, many such taxes remain in place. Economists tend to favor taxes on real property and improvements (land and structures), as they conform reasonably well to the benefits test. They help to pay for services tied to property ownership—local road maintenance, law enforcement and emergency services, and the like—and the value of the property is a reasonable, if imperfect, proxy for the value of those services. Many economists also favor property taxes over alternative forms of taxation, like income and sales taxes, because they have a relatively limited impact on economic growth and development. Whereas capital is frequently mobile, and can be shifted to lower tax jurisdictions, real property is immovable. Thus, while its value is affected by taxation, it cannot be moved due to tax costs. Tax jurisdictions levy property taxes in a variety of ways: some impose a rate or a millage—the amount of tax per thousand dollars of value—on the fair market value of the property, while others impose it on some percentage (the assessment ratio) of the market value, yielding an assessed value. Occasionally, valuations are made on income potential or other metrics. Some states have equalization requirements, ensuring uniformity across the state. Sometimes caps limit the degree to which one’s property taxes can rise in a given year, and sometimes rate adjustments are mandated after assessments to ensure uniformity or maintenance of revenues. Abatements are often available to certain taxpayers, like veterans or senior citizens. Localities frequently offer abatements or other property tax incentives to select companies. And of course, property tax rates are set by political subdivisions at a variety of levels: not only by cities and counties, but often also by school boards, fire departments, and utility commissions. Fourteen states and the District of Columbia have no state property tax collections whatsoever, while local governments in all states include levies on property in their tax mix. Property taxes comprise more than 90 percent of local government tax collections in thirteen states, led by Maine at 98.8 percent of local revenue, and under half of local revenue in only three. In New Hampshire, where property taxes are responsible for 16.8 percent of state and 98.7 percent of local tax collections, nearly two-thirds (66.1 percent) of all state and local tax revenue comes from property taxes. At the other end of the spectrum, only 11.5 percent of North Dakota’s state and local collections are derived from property taxes. The New England states rely the most heavily on property taxes (44.6 percent of state and local tax revenue), while the Southeast—where localities frequently turn to local option sales taxes as a significant source of revenue—has the lowest property tax reliance at 26.2 percent. Sales taxes are a significant source of both state and local government tax revenue. While economists generally draw sharp delineations among general sales taxes, excise taxes, and gross receipts taxes, the U.S. Census Bureau does not distinguish between taxes levied on sales and those imposed on gross receipts. Due to these data limitations, this category includes both general sales taxes and certain gross receipts taxes, though excise taxes are considered separately. General sales taxes are levied on goods and services generally (subject to a range of exemptions), while selective sales taxes, often called excise taxes, are special taxes or rates on the sale of particular goods or services. They tend to be collected on motor fuels, alcoholic beverages, amusements, insurance, tobacco products, pari-mutuels, and public utilities. Finally, a few states impose, or permit localities to impose, gross receipts taxes. These are business taxes levied on the entire receipts of a firm without deductions for compensation, costs of goods sold, or other expenses. Gross receipts taxes tend to be disfavored by economists, because the taxes fall on all stages of production, yielding “tax pyramiding,” whereby the same final transaction is exposed to taxes several times over. Imposed on gross income rather than net income (profit), such taxes also bear no relationship to a firm’s ability to pay. Washington State derives the highest proportion of state and local tax revenues from sales and gross receipts taxes at 45.4 percent of collections, due to its Business & Occupation (B&O) gross receipts tax and the absence of an individual income tax. It is followed by Tennessee at 40.9 percent and South Dakota at 40.4 percent. All three states forego a tax on wage income, though Tennessee does tax interest and dividend income. (That tax, called the Hall income tax, is currently being phased out.) South Dakota and Washington also forego corporate income taxes. Sales taxes were responsible for 23.3 percent of state and local tax revenue in fiscal year 2014, and tend to feature more prominently in state than in local tax collections, yielding 31.4 percent of state and 12.1 percent of local tax revenue. Forty-five states impose state sales taxes, while local sales taxes are collected in 38 states, typically through local option but occasionally as mandatory local taxes administered by the state. Alaska is unique in foregoing a state sales tax but permitting local option sales taxes. States which choose not to impose an individual income tax tend to increase reliance on the sales tax, while the states without a sales tax are more likely to look to severance taxes or miscellaneous business taxes for an outsized share of revenue rather than leaning more heavily on income taxes. Six of the ten states with the highest reliance on sales taxes forego at least one major tax, often the income tax. Consumption taxes are less harmful to growth than income taxes because they do not fall on saving, investment, or future consumption. Local governments in three states—Louisiana, Arkansas, and Oklahoma—derive more than 40 percent of their tax revenue from sales taxes. At the state level, six states rely on sales taxes for more than half their tax revenue, led by Florida (which also foregoes an individual income tax) at 60.7 percent. Texas foregoes both individual and corporate income taxes, but does impose both a sales tax and the Margin Tax, a gross receipts tax. Of the 45 states with a state sales tax, Vermont has the lowest reliance at 12.0 percent. The Southwest leans the most heavily on sales taxes, with 36.4 percent of revenue derived from these sources, while New England turns to sales taxes the least, at 12.5 percent reliance. 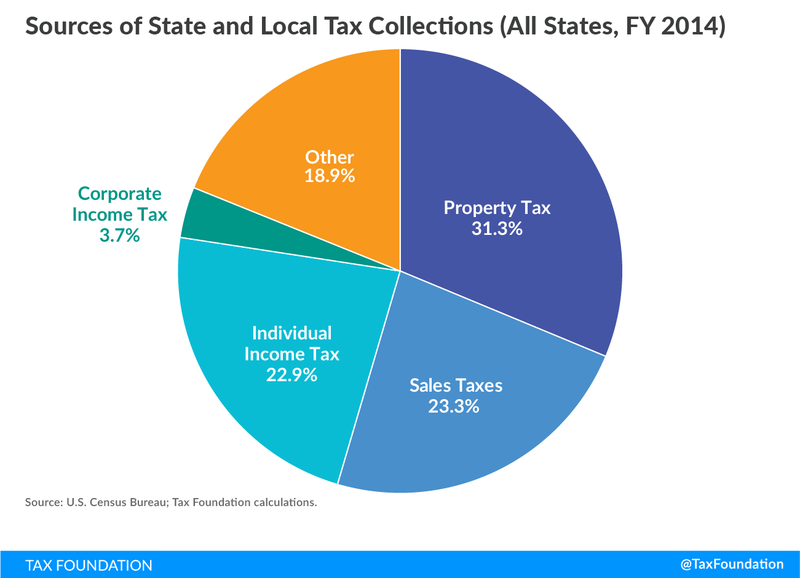 Local option sales tax collections are a significant source of revenue in the Southwest and Southeast, but play a negligible role in New England’s revenue picture. Individual income taxes are the second largest source of state tax revenue, accounting for 35.9 percent of state tax collections in fiscal year 2014, but their modest role in local tax collections (4.8 percent) yields a 22.9 percent share of total state and local tax revenue. Forty-three states tax individual income, including 41 which tax wage income. (Tennessee and New Hampshire only tax interest and dividend income.) At the local level, however, individual income taxes are significantly less common. The U.S. Census Bureau reports individual income tax collections by local governments in fourteen states and the District of Columbia. Several other states can be argued to feature local income taxes or a near equivalent—for instance, several West Virginia municipalities impose wage taxes of $2 or $3 per week—but this analysis is concerned only with those states where localities report individual income tax collections to the Census Bureau. Of these, localities in three states and the District of Columbia rely on income taxes for more than 20 percent of their revenue, led by Maryland’s local governments at 32.7 percent, while municipal governments in six states with local income taxes generate less than 4 percent of their revenue that way. Most states do not permit localities to levy their own income taxes. Oregon, which foregoes a sales tax, relies the most heavily on state individual income tax collections (68.7 percent), while among states which tax wage income, North Dakota has the lowest income tax reliance at 8.1 percent following cuts made while the state was flush with oil revenue. Of states imposing all the major tax types, Virginia has the highest individual income tax reliance at 57.4 percent. Total combined state and local reliance in states that tax wage income ranges from 1.6 percent in North Dakota to 40.8 percent in Oregon. Income taxes discourage growth more per unit of tax revenue than do consumption taxes because they discourage savings and labor force participation. In 2014, states which forego an individual income tax saw a net gain of nearly 113,000 taxpayers and $17.9 billion in GDP inflow, while states which impose all major taxes experienced a net out-migration of 128,000 and an outflow of $12.8 billion. Seven of the nine states that forego a wage income tax grew faster than the national average during the last Census period, and the other two experienced the fastest growth in their regions. Traditional arguments in favor of individual income taxation tend to focus less on state product and more on progressivity and revenue diversification, though consumption taxes are less volatile than taxes on income. The Mideast and Great Lakes states turn most strongly to individual income taxes, with combined state and local reliance of 28.2 and 24.5 percent respectively, while the Southwest, where income taxes are only responsible for 13.1 percent of revenue, looks to them the least. Regional variations are far more pronounced at the local level than they are at the state level, with all regions but the Southwest and Far West clustering between 30 and 35 percent state reliance. Although they garner a good deal of attention, corporate income taxes contribute relatively little to state and local government coffers, and their revenue tends to be highly volatile. Corporate income taxes are responsible for a mere 3.7 percent of combined state and local tax collections, which consists of 5.4 percent of state revenue and 1.3 percent of local revenue. Forty-five states tax corporate income. Of the five which forego a corporate income tax, all but one (Wyoming) imposes a gross receipts tax. New Hampshire has the highest reliance on corporate income taxation, at 23.7 percent, though this category includes not only the state’s corporate income tax but also its unique value-added tax, which is essentially a consumption tax. Alaska follows at 12.1 percent, and state reliance is under 10 percent in all but four states. Localities in seven states impose municipal corporate income taxes, led by New York, where corporate income taxes account for 7.5 percent of local revenue. New York is a significant outlier, both in that—alone among states—localities (chiefly New York City) rely more heavily on the corporate income tax than the state itself does, and in that no other state’s localities lean on the corporate income tax for more than 3 percent of revenue. Corporate income taxes are among the most economically disadvantageous revenue options, as they discourage the sort of activities which are most significant for growth, like investment in capital and productivity improvements. States also tend to carve out their corporate income tax base with tax incentives, undermining tax neutrality and raising tax costs for unincentivized businesses. Corporate income taxes are the most prominent in the Mideast region, where they account for 5.3 percent of combined state and local collections, but they are responsible for the greatest share of state revenue in the New England states, where local governments do not have the power to impose corporate income taxes. The Southwest demonstrates the lowest reliance, at a combined 2.0 percent. Although income (corporate and individual), property, and sales (including some gross receipts) taxes are responsible for over 80 percent of state and local tax revenue, a wide variety of other taxes fill out the remainder. Excise taxes on motor fuel, tobacco, alcohol, and other products are responsible for about half of the 18.9 percent of state and local tax revenue not accounted for by individual income, corporate income, sales, and property taxes, and are levied (to varying degrees) in all states. Unlike a general sales tax, these “selective sales taxes,” as they are sometimes called, discriminate among different kinds of transactions. Some of the remaining sources of taxation, like severance taxes, can be highly significant sources of revenue for a select few states. In Alaska, for instance, 84.2 percent of state tax revenue (and 53.8 percent of combined state and local tax revenue) comes from other taxes, chiefly the state’s Oil and Gas Production Tax. Other tax revenue sources, like motor vehicle license fees, business licenses, inheritance and estate taxes, recordation fees, and transfer taxes, have more modest revenue implications but are relied upon by states in varying degrees. North Dakota and Alaska, both resource-intensive states, have the greatest reliance on other forms of taxation, at 57.1 and 53.8 percent respectively, and Delaware, which has an extensive business licensing apparatus, also comes in high at 47.7 percent. Massachusetts and New Jersey have the least reliance, at 12.2 and 12.1 percent respectively. Nationally, other taxes account for 25.7 percent of state tax revenue and 9.4 percent of local tax revenue. Regionally, the highest reliance is in the resource-intensive Far West, while the lowest reliance is found in New England. State tax structures vary widely. The highest-income states rely more heavily on property taxes, while the lowest-income states lean on sales and gross receipts taxes. This is significantly a product of the sales tax-heavy Southern states disproportionately falling in the bottom quintile while property tax-centric New England states can be found in the top quintile, though the effect persists even neglecting these states. Reliance on individual income taxes does not correlate strongly with a state’s average household income. Over the years, income taxes have gained ground as a source of state and local government tax collections, sales tax collections have mostly been flat, and property tax reliance has declined precipitously. Property taxes continue to be the predominant source of revenue for local governments, but they long ago lost their cachet at the state level. Until the 1920s, property taxes yielded over 80 percent of all state and local tax revenue; today, property taxes account for less than one-third of collections (see Table 7). These shifts have economic consequences. Some states elect to forego certain taxes, often with the intent of spurring greater economic activity. Other states impose all the major taxes, frequently with the aim of diversifying their sources of revenue. Taxes differ on revenue stability, with corporate income taxes typically among the most volatile. They differ, too, in their distributional effects, with income taxes generally seen as more progressive than sales taxes. State and local governments must weigh competing policy goals in creating their tax structures, making important decisions about neutrality, equity, and economic implications. Each state’s tax mix encompasses both the legacies of the past and the ambitions of the present. But this means that each state’s tax code also reflects a patchwork of choices made over many decades, often yielding an overall design which is a poor reflection of policymakers’ purposes. It may be too much to ask states to adopt tax systems which look like someone designed them on purpose, but a state’s tax mix reflects its underlying policy assumptions, a mirror on the implicit aims the code has taken on over the years. Sometimes it pays to have a look in the mirror. Note: Collections for the District of Columbia are included under local tax collections. Note: Due to historical data limitations, sales, excise, and gross receipts taxes are combined in this table. Excise taxes are classified as “other taxes” elsewhere in this paper. New England Conn., Maine, Mass., N.H., R.I., Vt.
Mideast D.C., Del., Md., N.J., N.Y., Pa.
Great Lakes Ill., Ind., Mich., Ohio, Wis.
Plains Iowa, Kans., Minn., Mo., N.D., Nebr., S.D. Southeast Ala., Ark., Fla., Ga., Ky., La., Miss., N.C., S.C., Tenn., Va., W.Va.
Southwest Ariz., N.M., Okla., Tex. Rocky Mountain Colo., Idaho, Mont., Utah, Wyo. Alaska, Calif., Hawaii, Nev., Ore., Wash.
 36 M.R.S.A. § 4303, imposed at a rate of 1.5 cents per pound of wild blueberries processed in the state or shipped out of state. Ala. Const., amend. 351, to be optionally levied at a rate of one mill, with revenues dedicated to the control of “mosquitoes, rodents and other vectors of public health and welfare significance.” At 310,296 words, the Alabama State Constitution is 44 times longer than the U.S. Constitution. U.S. Census Bureau, State and Local Government Finances (FY 2014), https://www.census.gov/govs/local/; Tax Foundation calculations. All reliance statistics in this paper are Tax Foundation calculations from fiscal year 2014 Census data. The first year for which data are available. By 1922, property taxes had slipped to 36.7 percent of total state collections, and they accounted for less than 6 percent by the end of World War II. Joyce Errecart, Ed Gerish, & Scott Drenkard, “States Moving Away From Taxes on Tangible Personal Property,” Tax Foundation Background Paper No. 63, Oct. 4, 2012, https://taxfoundation.org/states-moving-away-taxes-tangible-personal-property/. Joan Youngman, A Good Tax: Legal and Policy Issues for the Property Tax in the United States (Cambridge, MA: Lincoln Institute of Land Policy) 2016, 13-15. Jens Arnold, Bert Brys, Christopher Heady, Åsa Johansson, Cyrille Schwellnus, & Laura Vartia, “Tax Policy For Economic Recovery and Growth,” 121 Economic Journal F59-F80, 2011. Id., 91 et. seq. and 193 et seq. See generally, Tax Foundation, Location Matters: The State Tax Costs of Doing Business, 2015, https://taxfoundation.org/publications/location-matters/. Less than half of collections in the District of Columbia come from tax collections as well, but as the federal district, its tax revenues represent a hybrid of state and local taxation. Regional classifications of states follow the Bureau of Economic Activity’s classification system. See Table 9. See, e.g., Thomas Stratmann & William Bruntrager, “Excise Taxes in the States,” Mercatus Center Working Paper No. 11-27, June 2011, https://www.mercatus.org/system/files/ExciseTaxesintheStates.Stratmann.Bruntrager_0.pdf. See generally, Justin Ross, “Gross Receipts Taxes: Theory and Recent Evidence,” Tax Foundation Fiscal Fact No. 529, Oct. 6, 2016, https://taxfoundation.org/gross-receipts-taxes-theory-and-recent-evidence/. Morgan Scarboro, “State Individual Income Tax Rates and Brackets for 2017,” Tax Foundation Fiscal Fact No. 544, Mar. 9, 2017, https://taxfoundation.org/state-individual-income-tax-rates-brackets-2017/. Scott Drenkard, “Success! Tennesee to Phase out the Hall Tax,” Tax Foundation Tax Policy Blog, Apr. 22, 2016, https://taxfoundation.org/success-tennessee-phase-out-hall-tax/. Morgan Scarboro, “State Corporate Income Tax Rates and Brackets for 2017,” Tax Foundation Fiscal Fact No. 542, Feb. 27, 2017, https://taxfoundation.org/state-corporate-income-tax-rates-brackets-2017/. Jared Walczak & Scott Drenkard, “State and Local Sales Tax Rates in 2017,” Tax Foundation Fiscal Fact No. 539, Jan. 31, 2017, https://taxfoundation.org/state-and-local-sales-tax-rates-in-2017/. William McBride, “What Is the Evidence on Taxes and Growth?” Tax Foundation Special Report No. 207, Dec. 18, 2012, https://taxfoundation.org/what-evidence-taxes-and-growth/, 4. 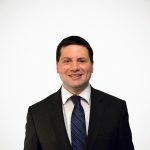 Joseph Henchman & Jason Sapia, “Local Income Taxes: City- and County-Level Income and Wage Taxes Continue to Wane,” Tax Foundation Fiscal Fact No. 280, Aug. 31, 2011, https://taxfoundation.org/local-income-taxes-city-and-county-level-income-and-wage-taxes-continue-wane/. Localities in Kentucky generate 25.7 percent of their revenue from individual income taxes, and Ohio municipalities collect 21.2 percent that way. The District of Columbia’s tax system, which includes many of the standard features of both state and local systems, derives 26.3 percent of its tax revenue from individual income taxation. Liz Malm, “North Dakota Cuts Income Taxes Again,” Tax Foundation Tax Policy Blog, Apr. 27, 2015, https://taxfoundation.org/north-dakota-cuts-income-taxes-again/. The Census Data used in this paper capture reductions through fiscal year 2014. Internal Revenue Service, “Migration Data 2014-2015,” https://www.irs.gov/uac/soi-tax-stats-migration-data-2014-2015. Michael Barone, “Census: Fast Growth in States With No Income Tax,” Real Clear Politics, Dec. 23, 2010, http://www.realclearpolitics.com/articles/2010/12/23/census_fast_growth_in_states_with_no_income_tax_108332.html. Jared Walczak, Scott Drenkard, & Joseph Henchman, 2017 State Business Tax Climate Index, https://taxfoundation.org/publications/state-business-tax-climate-index/, 26-27. Former Secretary of the Treasury William E. Simon, qtd., Blueprints for Basic Tax Reform, Department of the Treasury, Jan. 17, 1977, https://www.treasury.gov/resource-center/tax-policy/Documents/Report-Blueprints-1977.pdf, 2.